The RAM-HOL-AP8D2LU DOCK-N-LOCK Cradle for iPad features a dial combination lock that allows you to charge your iPad whislt it is mounted, and has AMPS hole patterns on the back of the cradle. 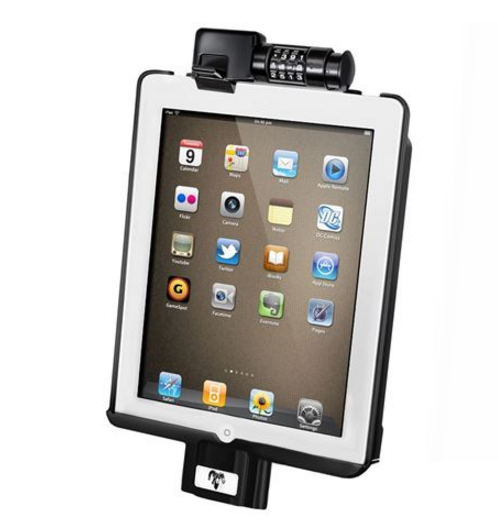 The RAM-HOL-AP8D2LU RAM DOCK-N-LOCK Cradle for Apple iPad from the RAM iPad & Tablet Mounts range is made up of an extra strong composite cradle, a dial combination lock, a docking connector and the patent-pending Uni-Conn for the Apple iPad 2. This product allows charging with the factory iPad cables with the docking connector, as well as other cables and modules with docking connectors on the market. This cradle can make your iPad the most useful item in your vehicle.